For quality paper production, proper moisture removal and high clothing life and efficient clothing run and preventing the damage to the Bearing/Rolls the optimum tension in Wires/Felts is must. 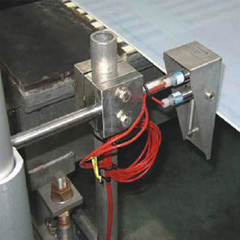 Very less tension causes reduced water drainage, hence increased re-moistening in press section and more steam requirement in dryers, more sheet breaks due to sheet fluttering in dryer, slippage between cloth and rolls resulting into clothing abrasion, difference in machine drive and fabric speed and ultimately affects Fabric Guiding. 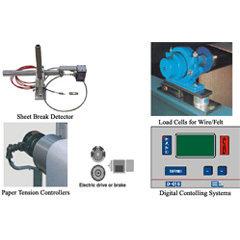 Excessive tension in clothing may damage roll/bearing, marking on sheets, contraction in the width of the clothing, reduced service life of clothing, cloth tearing, less water drainage. 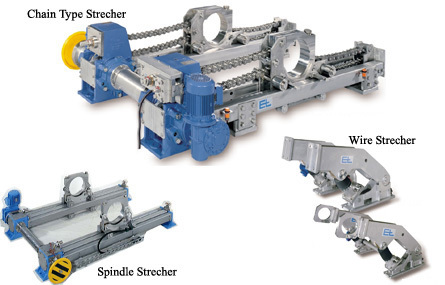 For Wires we provide Unique lever arm type stretchers, for Felt/Dryers we provide Spindle type dryers and for very long stretcher stroke we provide chain type of stretchers. All of the stretchers are available for Completely Automatic Operation with tension measuring and display device and automatic motorized actuation. We can provide manual motorized stretchers to start with.